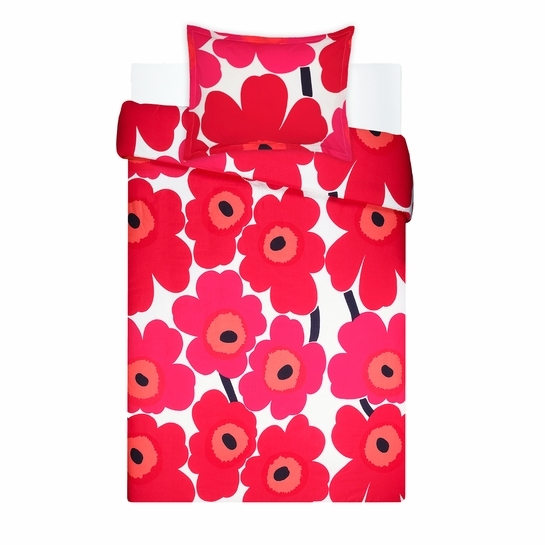 More about Marimekko Unikko Red Twin Duvet Cover Set Wake up to the cheery poppies of the famous Marimekko Unikko pattern. Maija Isola designed the bold blossoms in 1964 yet the pattern still resonates with the world half a century later. In the original red and white colorway, this classic will never go out of style regardless of coming and going trends in home decor. The 200-thread-count, 100% cotton percale bedding set is machine washable and will be as appealing to snuggle up in as it is to look at for many years to come. This set includes: One duvet cover and one standard sham. A high-quality weave, percale has a noticeably tighter weave that allows for a higher thread count which makes the sheets softer to the touch. Medium in weight, the fabric is matte with no additional sheen or shine but the texture is very smooth and able to resist warping and washes exceptionally well. 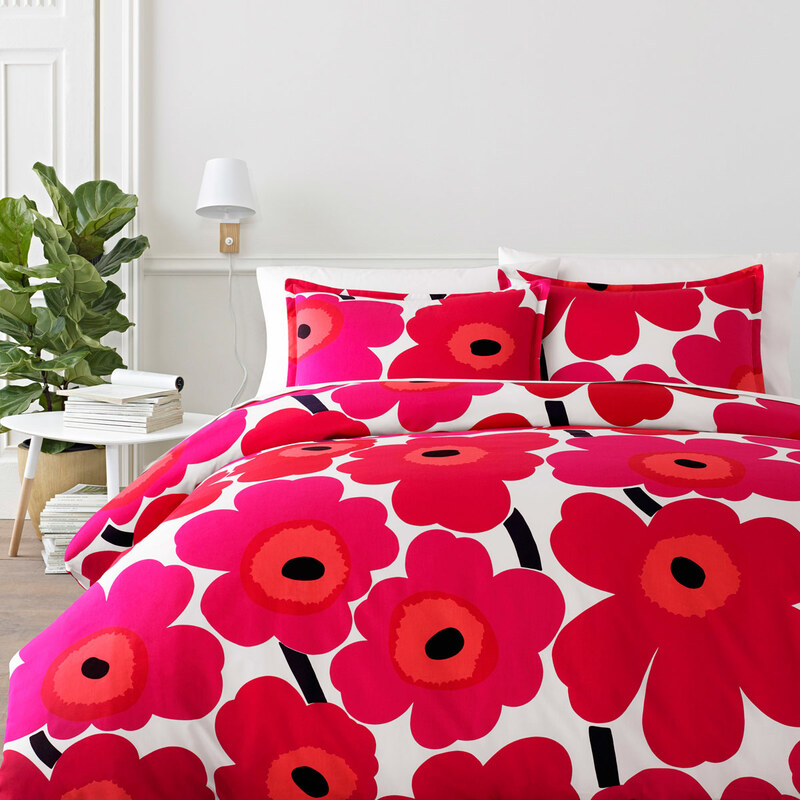 I am a big fan of Marimekko, and I needed a second comforter to finish a guest bedroom in Palm Springs. The Marimekko look really compliments the mid-century style of the place. Initially I ordered the duvet cover set by mistake. I meant to order the comforter. My exchange was easy, and I was especially impressed by their customer service. I've bookmarked FinnStyle and will definitely use them again. Yes - there is a mixture of Fuchsia and Red in the pattern. I' INTERESTED IN THE QUEEN DUVET - WHAT IS THE FABRIC LIKE? A SHEET OR HEAVIER? The Duvet COVER is used to cover over your current duvet or comforter. The material feels like a heavier sheet if you do not put a duvet or comforter inside of it. Could you please tell me if the stems and centers of the flowers on this duvet cover are black or dark blue. Thank you!